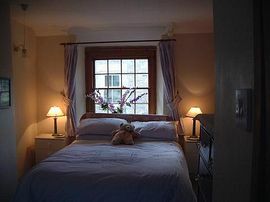 The single bedroom runs the full width of the cottage and has one double and one single bed. 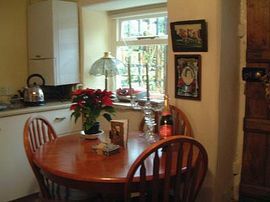 The kitchen is equipped for self catering and there is colour TV and VCR in the lounge. There is off road parking to the front and a pleasant rear garden with patio and lawns. Garden furniture and a gas fired barbecue are provided. 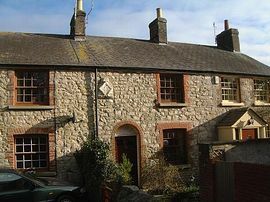 The cottage is located in the centre of Upwey Village in a rural and peaceful setting. There are three local pubs, two of which provide excellent food all within five to ten minutes walk. The famous Upwey wishing well with its excellent daytime restaurant and lovely water gardens is just five hundred yards away. Weymouth and its award winning sandy beach are just four miles distant and the county town of Dorchester is also four miles away. There are nearby golf courses at Came Down and Weymouth and for walkers there are lots of local paths and river walks, also the inland coastal path runs along the top of the hill to the rear of the cottage. 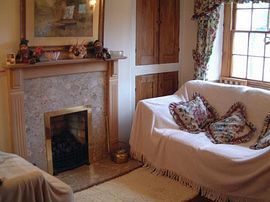 Owners Ann and John live in the cottage next door and are always available for assistance during your stay. Local Services: Two pubs with restaurants in short walking distance. local wishing well and restaurant. Bus route to Weymouth and Dorchester. Local Upwey rail station 1 mile. Take the A354 from Dorchester, descending the ridgeway hill, under a railway bridge, at the bottom of the hill where the main road goes to the left, turn right into Elwell Street. Go to the T junction at the bottom of Elwell Street. At the T junction turn right into church street and Jasmine cottage is 100 yards on the right. November through March: £50.00 per day £250.00 per week. April through June: £60.00 per day £300.00 per week. July through August: £70.00 per day £350.00 per week. September through October: £60.00 per day £300.00 per week. Full tariff is published on our website. Visitors book full of comment by happy guests over the last ten years.